This is one of the standard international textbooks on child and adolescent mental health. Its strengths lie in its up-to-date, evidence-based approach to practical clinical issues and its comprehensive multidisciplinary perspective. A well-established and popular comprehensive textbook, it combines the shared knowledge, experience and expertise of three major, internationally recognised, academic and clinical practitioners in this field. It covers all aspects ofdevelopmental psychology, behavioural and emotional disorders, types of therapy and prevention, with a special emphasis on developmental considerations and on ways in which physical health and psychological problems interact. The up-to-date content gives scholarly overviews of all relevant areasincluding genetics, neurodevelopment, developmental psychology, attachment theory, social aspects, service provision and child and adolescent mental health. The new edition also includes comprehensive sections on developmental disabilities, as well as adolescence and psychological aspects of physical disorder in young people. 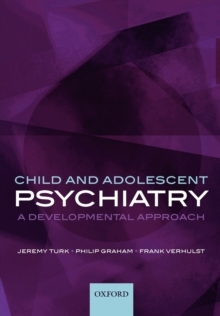 Updated throughout, the 'Child and Adolescent Psychiatry' provides necessary and useful information for all professionals dealing with emotionally, behaviourally and developmentally disordered children and their families. It will be essential for all trainees in child and adolescent mental health, as well as paediatricians,psychiatrists, psychologists, nurses, speech and language therapists, social workers, clinical service managers and commissioners.